Bronze arrowhead embedded in spine shows elite Iron Age warrior survived battle. This pre-Scythian burial is fascinating because this dude survived an arrow to his back and not only lived, but lived for a while as his vertebra healed around it. Ouch. Food, fighting, fun, and 7 other reasons our ancestors used fire. Three new papers out this month on the origins and use of fire caused me to write this mash-up. Unfortunately, very few people were interested in reading it. Guess crazy bone wounds are more fascinating. The 6 'body farms' help forensic anthropologists learn to solve crimes. 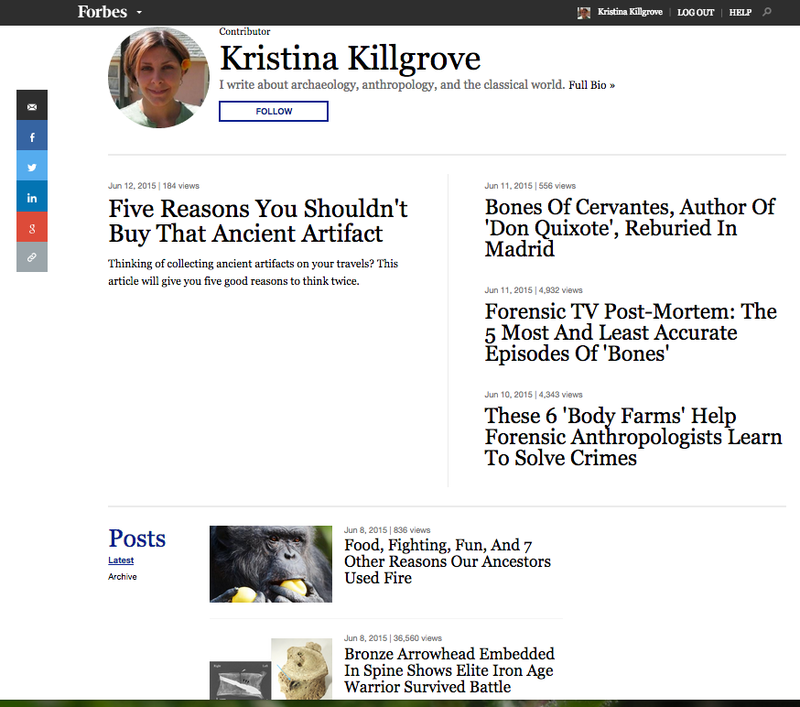 Tiffany Saul, a grad student at UTK, suggested I write about body farms, so I invited her to coauthor a piece with me. We contacted all the directors to ask about their favorite research to come out of their facility. It was great to get help on this piece, especially from Tiffany, who is super involved in biological anthropology outreach! Oh, and Kathy Reichs herself even posted this on her Facebook page and Twitter! Forensic TV post-mortem: the 5 most and least accurate episodes of Bones. I wrote this piece over a month ago when I thought the show was ending... and then they had 3 more episodes. Oops. This is a meta-post on the episodes I did and didn't like. Bones writer and producer Hart Hanson even tweeted that "I kinda love this." Bones of Cervantes, author of Don Quixote, reburied in Madrid. The mayor of Madrid dedicated a new monument to Cervantes, whose possible bones were recovered earlier this year. I wrote up a very quick post for the occasion, as I covered the search for Cervantes a few years ago here. Five reasons you shouldn't buy that ancient artifact. If you're an archaeologist, chances are someone's asked you to evaluate or appraise an artifact. Here's why you shouldn't do it, and why people shouldn't buy antiquities without doing a lot of background research first.